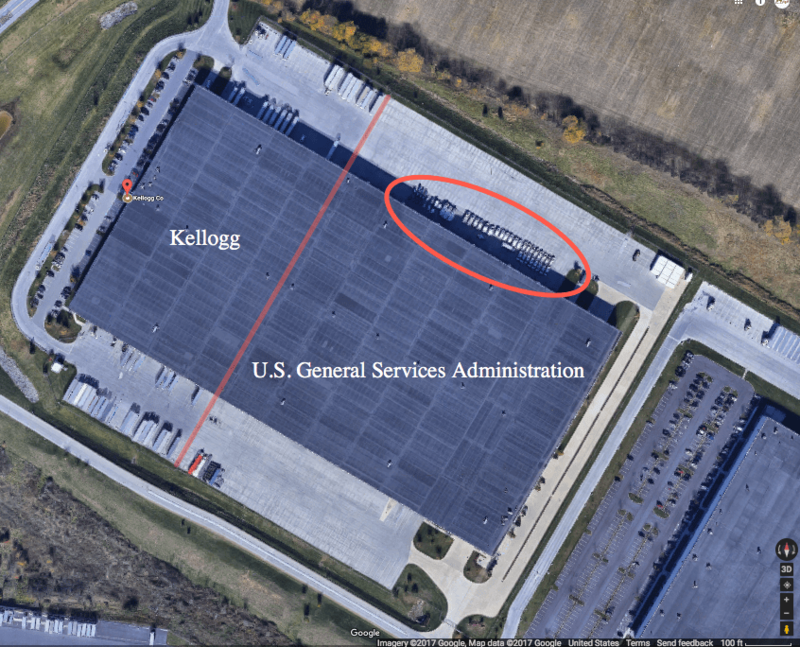 In Maryland, just outside of Baltimore, an entire unit of heavily armed United Nations vehicles sit behind a mysterious Kellogg Cereal Plant (as of September 2017). Thanks to the work of Alastair Williamson (video footage below) we now know that UN vehicles are currently standing by for … well that’s the question. This unprecedented circumstance can not be simply explained away, as the current location of the vehicles, in and of itself, is enough for anyone to see that something is not quite right here. The hardly trustworthy, and highly discredited Snopes, was, as always, the first out of the gate to tow the government line, and obfuscate the reality at hand when this topic was first addressed. In this case, it was a Facebook user in June of 2016 who released images of a litany UN armored vehicles that were spotted on Interstate 81 near Lexington, Virginia. The claim was made that these were “built in Virginia for UN purposes abroad.” This hollow claim was of course followed by the requisite omnipotent, all-encompassing red X indicating a “debunked story.” As hollow as that claim was, it was likely accepted by the many who simply refuse to see the current trajectory of the US government, and its Deep State controlling hand. Yet, it should still be noted that the claim is entirely possible nonetheless, as anything truly is. It should be clear to all that this is highly speculative, and not the typical coverage one would expect from The Last American Vagabond. However, with what we are seeing play out currently in Chicago, with the Cook County Commissioner Richard Boykin meeting recently with the Assistant Secretary General of the United Nations himself, during which he requested that the world governing body send troops onto the violence-plagued streets of Chicago, effectively surpassing the National Guard altogether, it becomes impossible not to see the impending “solution” to the problem at hand. …but it is important not to get the cart too far ahead of the horse, especially when dealing with such an important aspect to a potentially game changing situation. So I leave it to you, my fellow Vagabonds, to do your due diligence, and ask yourselves if you think the US government, or rather, the Deep State controlled US government is capable of not only violating the Constitution by allowing foreign troops on US soil, but if it is capable of actually creating a problem big enough, that caused a strong enough reaction, so that the government presented solution would not only be allowed, but welcomed with open arms. I just talked to my son who lives in Chicago. He didn’t know what I was talking about – UN Peacekeepers, Martial Law???! Small pockets of gangs who fight each other! Let’s be Vigilant, but not panic!!! No one is panicking, simply reporting the facts. The Cook County Commissioner Richard Boykin meet recently with the Assistant Secretary General of the United Nations himself, during which he requested that the world governing body send troops. Regardless of what the average person knows (and our own history shows us just how little the locals typically are told, and MSM certainly isn’t addressing it) those are the facts. Let’s also be able acknowledge the truth at hand, no matter how unnerving it might be. You ask is the government capable of these things. Absolutely!! I don’t know if this is the case,but anyone who trusts the government is naive! !